Grind the ingredients under the heading "To Wet Grind" using little water to a smooth paste n keep aside. 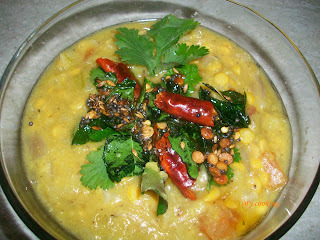 Cook chana dal & moongdal together with 2-3 cups of water using turmeric powder when it is 3/4th done, add vegetables and ground coconut paste. Mix well add necessary salt and cook covered till the raw smell of the masala goes off. then add the tempering to the kootu/curry . Cabbage kootu is ready.It goes well with rice, rotis n dosa. this koottu can be done with chana dal alone or moongdal alone but the combo gives nice taste. instead of cabbage u can also add, chayote, turnip, radish, bottle gourd and ash gourd or any deisred vegetables. thanks a lot & best wishes!! Delicious and comforting kootu.. Seems to be very healthy too.. I tried this and it came out very well.